Founders entrepreneurs wishing to launch their start-ups should consider to possibility to get training, mentoring, support and investment from either incubator or accelerator. In recent years, especially between 2011 and 2014 London experienced a boost of incubators and accelerators. Why did it happen all of a sudden? Are they useful? What are the differences between both of them? Which is more useful and perhaps better suits entrepreneurs needs? Incubator vs Accelerator. Lets first discuss the definition and difference between incubator and accelerator. As summarized in the table below, incubator’s original purpose is to help to launch the start-up, while accelerators are designed to helps to foster the growth. In reality and practice, there are many programmes in between two of them. After examining London incubators and accelerators, it seems that accelerator type programmes are more efficient and useful for both organizers and founders. Accelerators seems to be more proactive, focused and thus able to achieve what founders want. Accelerators are very motivated due to equity investment, which later on could also bring return and make accelerator more financially sustainable. London is the European capital of start-up (0.5 million new companies only in 2014) incubators and accelerators: 36 programmes (comparing to 60 in UK and 1250 in US), currently running – 12 incubators and 24 accelerators. London is potentially a gateway to US markets. It has the capacity to attract entrepreneurs from around the world and the government is keen to support start-ups. 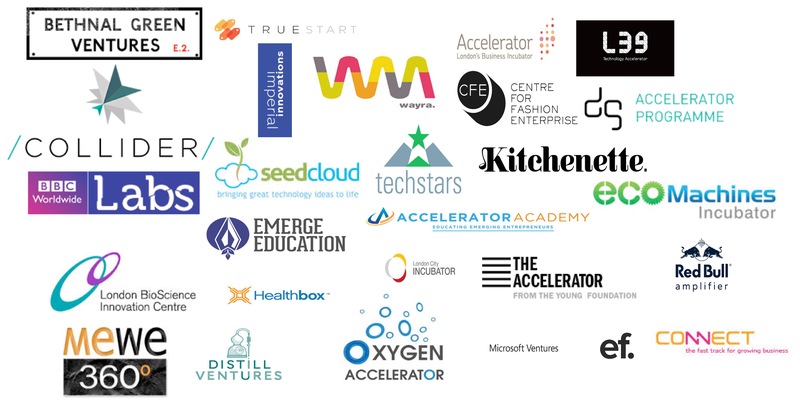 Of the start-up programmes operating within the UK in 2014, more than half were launched within the last three years. UK seems to catch up and follow success in US accelerators, particularly Silicon Valley’s Y-Combinator, which lists tech giants Airbnb and Dropbox among its success stories. While this is a boom time for accelerators and incubators the rapid rise in programmes has led some to fear that the UK is witnessing an accelerator bubble that will sooner or later burst. According to Harvard Business Review, there are over 7500 business incubators around the world and most of them fail. The first business incubator in the US opened in 1959 and is still operating. In the last couple of years, we have seen a renaissance in the incubator business. For incubators to live up to full economic potential, they need to overcome two problems: (1) they need to provide real value and meaningful program content, not just office space, (2) they need to measure success in more than just outside funding. 99% of companies should operate as organically grown, self-sustaining businesses — bootstrapped, without external financing. Two things determine whether a business can get off the ground successfully and sustainably: (1) a validated market opportunity with customers willing to pay for a product or a service and (2) a product or service that addresses such an opportunity. It is very important to gain reference customers, complete at least a minimum viable product, and incubators and accelerators have to focus on this. Start-ups within incubator or accelerator raise an average of £68’000 and the survival rate after two years stands at 92% compared to 73% for firms that go it alone, according to O2 report. Nearly 1/3 of the UK’s incubators make pre-seed investments in start-ups. These investments range from £10 k to £20 k but can be as much as six figures. Incubators traditionally targeted digital start-ups but, increasingly, new organisations are launching to help new firms in other sectors, such as food, healthcare, and fashion. Over 40% of start-up programmes are privately run (but a third of these receive public funding), and nearly 25% are funded by universities or business schools.